Select all the movie shots where at least one of the characters shown is a ghost. This question is worth double points so choose wisely! 7) In the spook-fest "Poltergeist", what did one of the lab guys eat in the ktichen, only to see that it was covered in maggots? 4) How did the college student, whose ghost came back to haunt Harrison Ford and Michelle Pfeiffer in "What Lies Beneath", commit suicide? 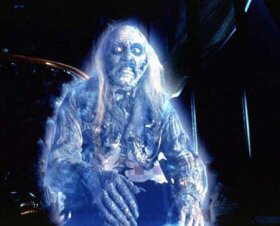 8) What movie is this ghost from? 5) Scary Movie 2 featured one parody scene involving a ball bouncing down a set of stairs and stopping at the bottom. What ghost story was this originally from? 9) Which smash movie was supposedly based on a true events that happened in 1975? 6) Which 'Ghost' movie isn't about supernatural spirits? 10) How many high school students died on the same day at the opening of the ultra-cool-spooky Japanese flick "Ring"? Click here for some spook-tacular No-Sound hints!